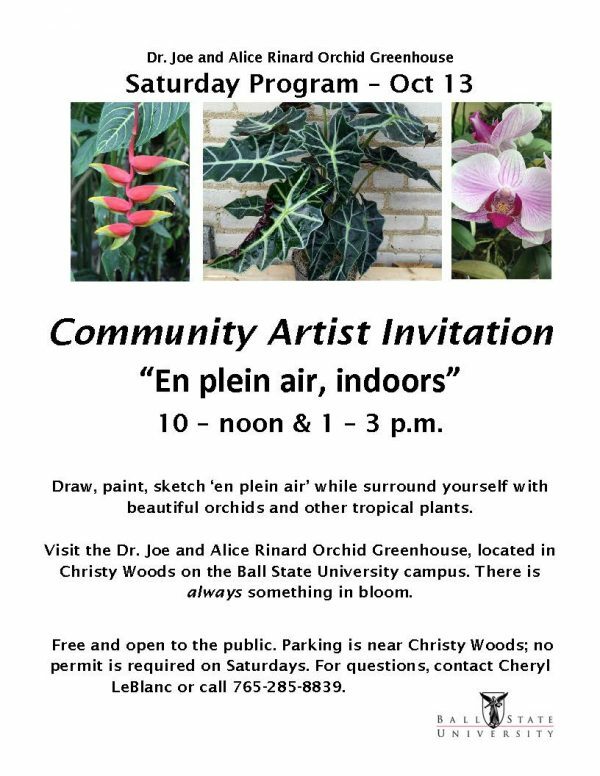 Community Artist Invitation “En plein air, indoors” 10 – noon & 1 – 3 p.m. Draw, paint, sketch ‘en plein air’ while you surround yourself with beautiful orchids and other tropical plants. Visit the Dr. Joe and Alice Rinard Orchid Greenhouse, located in Christy Woods on the Ball State University campus. There is always something in bloom. Free and open to the public. Parking is near Christy Woods; no permit is required on Saturdays. For questions, contact Cheryl LeBlanc or call 765-285-8839.